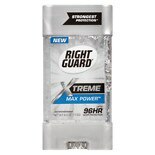 Shop Right Guard Xtreme Antiperspirant Gel Max Power (4 oz. )4 oz. $449$4 and 49 cents$1.12 / oz.